For the first time since Free Comic Book Day began, I won’t be going to a comic store for Free Comic Book Day. 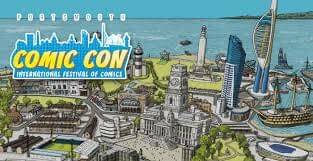 Instead, I find myself at an ungodly hour catching buses and trains to Portsmouth Comic Con, nicknamed JoelCon by everyone due to the involvement of Tripwire Magazine‘s Joel Meadows. A bunch of American and British comics guests reminiscent of the old eighties; UKCACs which were Joel’s stomping ground, it seems a show out of time – with a guest list diversity to boot. Which is probably in keeping with the fifties-vibe of Portsmouth, though to be fair they did just vote out incumbent BNP councillors. Adjacent to a naval base, it may also have a San Diego feel to it too. And hopefully being a naval town, the show won’t be able to drink the bars dry, as usually happened with UKCACs. There are packed panels through the weekend, and it will be hard narrowing choices down. Although I am amused that Dirk Wood’s panel for the Full Bleed hardcover magazine/anthology is called ‘Bleeding Cool’. Is that just a really obvious attempt to get me to attend? It may well work. If you’re going, feel free to say hi. I’ll be the one with the beard, longish hair and glasses. That should really narrow it down. And hey, depending on the gout, maybe I’ll make it to relatively-local comic shops Ian’s Books And Comics or Room 237. It is Free Comic Book Day after all.